Ghoul evening, kiddies! It’s your old pal the Cryptkeeper, here with a madness report on my favorite TV scare-ies, Tales From The Crypt! Buried in today’s announcement that TNT is driving a stake through its TV adaptation of Let The Right One In, you may have missed the boos that the network is also putting M. Night Shaymalan’s Tales From The Crypt revival on ice! HAhahahahaahahahahahhaaaaaaaaaaaaahh! The reason for this deadlock is some legal maneuvering around the original comic-book versions of my terror tales, whose intellectual frights are apparently more complicated than the dead-time stories in the Necronomicon! Speaking of unholy entities from the realms of madness, TNT’s lawyers are sorting out the grave situation, with one telling Deadline, “TNT and others have been pursuing a solution for more than a year, with significant progress being made. We look forward to the potential for further active development of this valuable franchise once the clearance process is fully resolved.” I don’t know about you, but the last time I heard legal jargon like that, it was at my divorce pro-screamings! HAHAhahahaha! But don’t fret, kiddies, because TNT promises that Tales From The Crypt will rise from the grave to terrorize TV boo-ers soon. 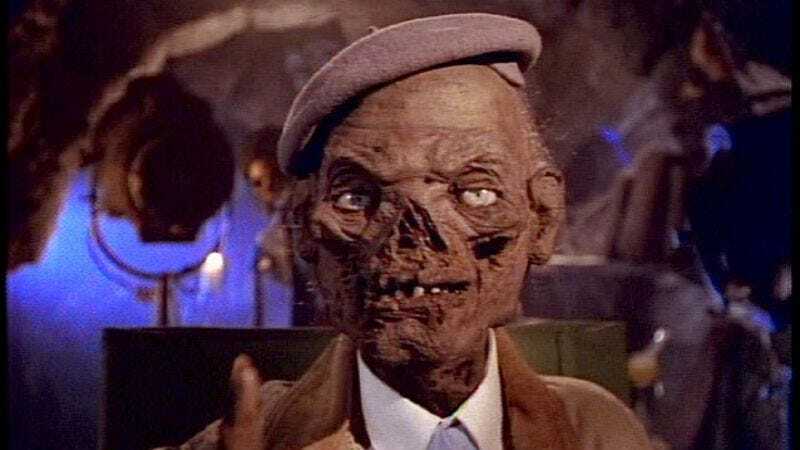 Until then, this is your hateful friend The Cryptkeeper, wishing you pleasant screams! HahahahahahahahahahahahaHAAAAAhahahahaha!